What's New for the 2019 Alfa Romeo Giulia? America has seen the gorgeous Alfa Romeo Giulia sedans selling for three years. The 2019 model comes with a few fresh new updates. The Giulia Ti Sport is now equipped with the standard 19-inch aluminum wheels. Meanwhile, the Quadrifoglio is equipped with a third headrest, split-folding seats in the rear, and brake calipers that feature an Alfa Romeo script in red. The Italian sedan is also being offered in several new and improved styling packages. 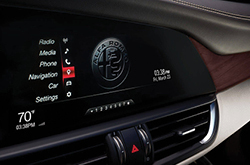 Which Trims are Available for the 2019 Giulia? The base trim comes with two configuration options. The main difference between them is that the first option has 4-door rear wheel drive, while the second has 4-door all-wheel drive. As such, the second option is slightly pricier than the first. The only other difference is in the EPA-estimated MPG. 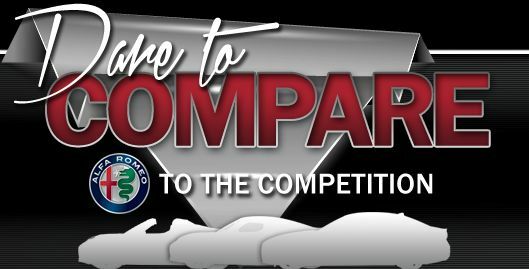 The rear-wheel drive's combined MPG is 27, while the all-wheel drive is 26. These specs remain the same across both configurations: a 280 horsepower, four-cylinder premium engine, and an 8-speed automatic transmission with an auto-manual feature. There are 12 exterior colors to choose from with a total of 5 seats. The Ti trim, like the base trim, comes in a rear-wheel and all-wheel drive configuration. The estimated combined MPG for the rear-wheel is 27, while the all-wheel is 26. Other specifications remain the same as the previous trim, except for the exterior color options. There are more sleek and flashy options, with a total of 14 colors to choose from. 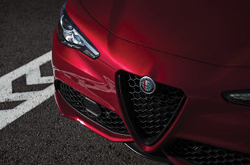 The Quadrifoglio trim doesn't have multiple configuration options, but you can add packages to it. It has a combined EPA-estimated MPG of 20. What really makes this car pop is the 505 horsepower, six-cylinder engine. There's unbelievable power under the hood. 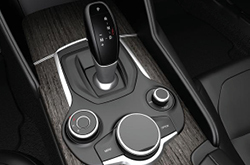 The transmission is the standard 8-speed with a manual option, and the vehicle is available in 9 exterior colors. Engine options haven't changed since the 2018 models drove onto the scene. Both the Giulia and upgraded Giulia Ti have a powerful turbocharged four-cylinder 2.0-liter engine. It develops 280 horsepower and a stunning 306 lb-ft of torque. The Giulia Quadrifoglio is outfitted with a purring twin-turbo V6 that has a stunning 505 horsepower and 443 lb-ft of torque. The Quadrifoglio is a crazily powerful car. The range topper is able to accelerate from 0 to 62 miles per hour in less than 4 seconds, and the vehicle has a top speed of 191 miles per hour. For anyone who's wanted to feel like their engine is a living beast ready to carry you off on adventure, this is the car for you. The brightness of the headlights is a good way to guarantee that you'll always be seen and be able to see on the road. If you use the Q4 All-Wheel Drive vehicle, you'll be able to transfer vehicle torque to wherever you need it for your responsiveness and traction. All vehicle systems are monitored through the chassis domain control, and the drive mode selector lets you have better control over the vehicle's handling. What is Alfa Romeo's best selling model?